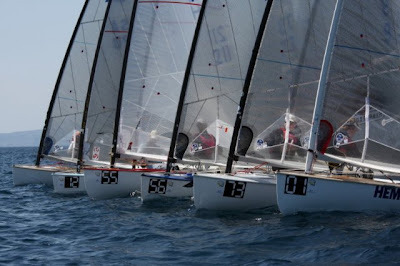 Slovenian Gasper Vincec and Dutch Pieter-Jan Postma win race 3 and race 4 on the second day of racing The second day of racing at La Marina di Scarlino today. The first race of the day went to Gasper Vincec (SLO 5), followed by French Guillame Florent (FRA 73) and by Canadian Christopher Cook (CAN 41) in third position. The second race was won by Dutch Pieter-Jan Postma,(NED 842), followed by Christopher Cook (CAN 41) and by Slovenian Gasper Vincec (SLO 5).